Maxitech at Stripe Sessions 2018! Not long ago, we were at the invite-only Stripe Sessions 2018 Event at historic Pier 35 in San Francisco. The full-day event focused on how leaders at high-growth companies can reimagine the role and opportunity of payments in their businesses. Founded by Patrick Collison (30) and John Collision (28) in 2010. The brothers are originally from Ireland. The initial spark for Stripe came from Patrick who noticed the difficulties in accepting payments on the web. Their first MVP (Minimum Viable Product) took only 2 weeks to build, but about 6 months of iterative feedback from users to build the real first version. Stripe has raised $685 Million to date from investors including Sequoia, Andreessen Horowitz, Kleiner Perkins, Khosla Ventures, General Catalyst, Thrive Capital and Tiger Global Management. As of today, Stripe is now valued at $20 Billion. Stripe has acquired 7 other startups so far. Stripe is headquartered in San Francisco, with 9 global offices in Dublin, London, Paris, Singapore, Tokyo, and others. What an incredible journey! The event in San Francisco was partly to share information about the company’s success and the founders’ vision for Stripe, as well as to showcase to their users how payments can present an opportunity in their businesses. It was also a good opportunity for attendees to hear about the latest trends in the payments space. The event kicked off with the Keynote Presentation by Patrick Collison where he shared the latest updates as well as new product and feature announcements. He defined Stripe as an infrastructure company and shared that more than 1 million businesses are using Stripe. 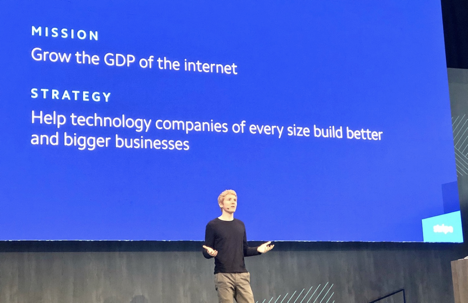 He was very clear about Stripe’s mission: To increase the GDP of the internet. He says despite internet businesses growing faster than the rest of the economy, only about 3 percent of global commerce happens online today. He also shared that Stripe will have R&D Hubs in San Francisco, Dublin, Seattle, and Singapore. He said that they will hire thousands of engineers and product managers to work in these engineering and product development hubs in the coming years. He says the best way to deliver Stripe products that will capture the needs of businesses is to work in close proximity to these businesses and global tech hubs where the global changes are happening. That is how they picked these four cities for their R&D Centers. After the keynote, there were 8 more sessions where speakers shared insights on how to rethink payments from building new business models, to scaling payments globally. 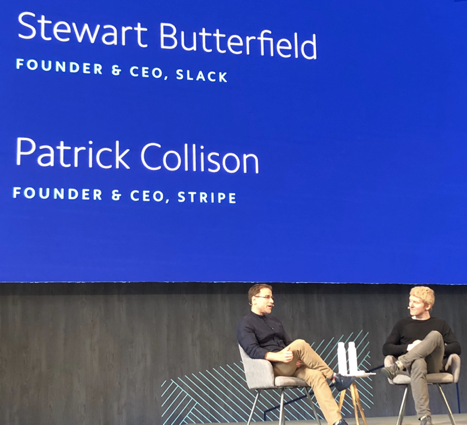 At the closing session, Patrick Collison hosted Slack co-founder and CEO Stewart Butterfield for a fireside chat. Bridging enterprises with global innovation that matters.